One hundred years ago, on December 8, 1915, the British satirical magazine Punch published John McCrae’s poem “In Flanders Fields.” Composed during the brutal fighting of the Second Battle of Ypres, the poem became the most popular poem of World War I. As a call to arms by a poet soldier, it was used for recruitment and fundraising during the war, and in commemoration after. Its key symbol, the poppy, became iconic in Canada and around the world. How do we read this poem today at the centenary of its first publication? What is this poem’s meaning for a young generation? Sixteen graduating students in the English Department at Ryerson University have spent the last term exploring this poem’s contemporary relevance, and have organized their findings for a public symposium and exhibition. Their presentations and discussions explore a range of topics, including the poem’s publication context in Punch; the cultural history of the poppy; “In Flanders Fields” on the Canadian ten dollar bill; “In Flanders Fields” in music; and the role of the poppy in visual war art. The symposium, which took place on the poet’s birthday on November 30th, is accompanied by an exhibition of rare and original materials illuminating the history and circulation of the poem and the evolution of the poppy as a symbol of remembrance. Ephemera on display include a rare and moving letter written by John McCrae to his mother on the eve of the war, and vintage posters and sheet music revealing the popular circulation of the poem in Canada and the United States. The exhibition also includes an installation involving 800 commemorative poppies. The exhibition runs in the MLC Gallery from November 30 to December 10. 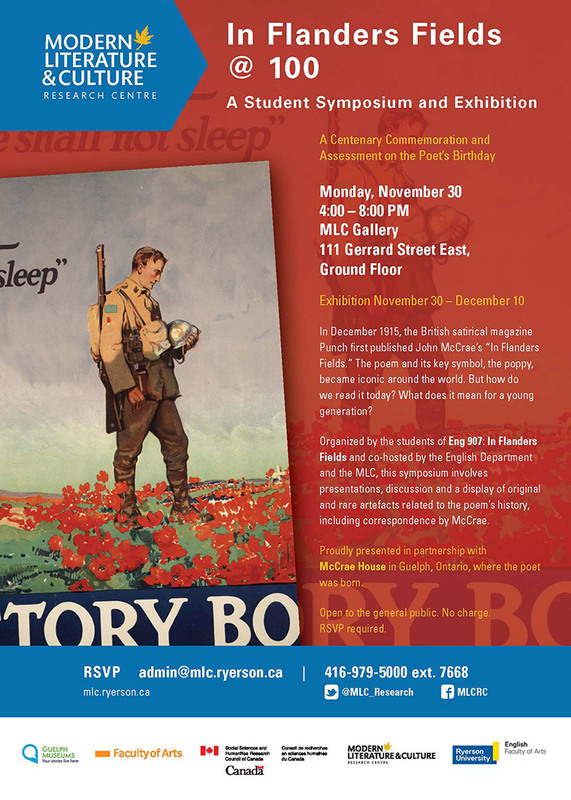 Organized by the students of Dr. Irene Gammel’s English 907: In Flanders Fields (Senior Projects Course), this event is hosted by the English Department and the Modern Literature and Culture Research Centre at Ryerson University. It is presented in partnership with McCrae House (Guelph Museums) in Guelph, Ontario, where the poet was born. This event is supported through funds received through a Faculty of Arts Special Events grant as well the Canada Research Chairs program. The MLC Gallery is supported through funds provided by Canada Foundation for Innovation and Ministry of Research and Innovation. John McCrae in uniform circa 1914. Photo: William Notman and Son, Guelph Museums.